The Giants took punch after punch last season, so it’s difficult to pinpoint exactly what hits inflicted the most damage. There was the Madison Bumgarner shoulder injury, the Johnny Cueto blister issue and the Mark Melancon pronator saga, but all of those came when the team’s pitching staff was already bruised. The first blow San Francisco suffered actually came in Spring Training, when the bullpen lost key left-handed reliever Will Smith to a season-ending UCL injury. After missing the entire 2017 campaign, Smith agreed to terms with the Giants on Friday and avoided the arbitration process. According to Bob Nightengale of USA Today, the 28-year-old southpaw will make $2.5 million in 2018, which is the same salary he earned last season. On Thursday evening, Smith joined Kevin Frandsen & Drew Hoffar on KNBR to discuss his recovery process following the Tommy John surgery he had last spring, and explained how excited he is to take the mound again this year. After seven weeks of rest, Smith returned to the Giants’ Scottsdale complex on Monday and resumed his throwing program. In September, Smith told me that his initial plan following surgery was to shoot for a May 1 return to the Major League level, but acknowledged it was still possible he could come back faster. On Thursday, Smith told Frandsen & Hoffar that he hasn’t faced a setback during his rehab and that he might soon be able to throw off a mound. Though he spent the year on the disabled list, Smith was active in the Giants’ clubhouse and around the team for much of the regular season. Smith kept his locker around the rest of the Giants’ relievers and said he spent a lot of time watching video with fellow left-hander Josh Osich to keep his mind fresh. On Thursday, Frandsen asked Smith if he might return with a new offering in his arsenal, and Smith said having the year off allowed him to explore different possibilities. The return of a healthy Smith is critical for a Giants’ bullpen that lacked consistency from its left-handers last year. After enjoying the stability of Jeremy Affeldt and Javier Lopez during the team’s successful run earlier in the decade, neither Osich or Steven Okert was able to handle late-inning matchups with ease. Over five Major League seasons, Smith owns a 3.88 earned run average as left-handed hitters boast a .243 career batting average against him. 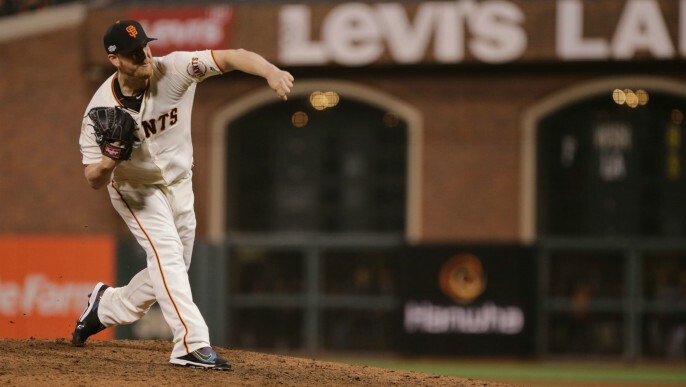 Smith’s integration back into the Giants’ bullpen is important for a team that might not be able to afford a free agent reliever this offseason, and so far, his recovery process has yielded promising returns. To listen to Smith’s full interview with Frandsen & Hoffar, click the podcast link below.